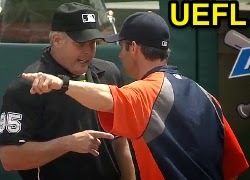 HP Umpire Tim Timmons ejected Tigers 1B Miguel Cabrera and Manager Brad Ausmus for arguing a check swing (swing/strike) call and Instant Replay Review upheld 1B Umpire Tim Welke's out call in the top of the 6th inning of the Tigers-Indians game. With two out and one on, Tigers batter Miguel Cabrera attempted to check his swing on a 0-0 slider from Indians pitcher Carlos Carrasco. Replays indicate Cabrera attempted to strike the pitch, Timmons' call was correct. At the time of the ejections, the contest was tied, 7-7. One batter later, with two outs and two on, Tigers batter Victory Martinez hit a 2-1 changeup from Indians pitcher Carrasco on the ground to shortstop Asdrubal Cabrera, who threw to first baseman Nick Swisher as Martinez arrived at first base. Upon Replay Review as the result of a challenge by Tigers Acting Manager (Bench Coach) Gene Lamont, Welke's ruling was affirmed, the call was correct. At the time of the review, the contest was tied, 7-7. The Indians ultimately won the contest, 11-10, in 13 innings. This is Tim Timmons (95)'s second, third ejection of the 2014 MLB Regular Season. This is Tim Welke (3)'s fifth Replay Review of the 2014 MLB Regular Season. This is Crew Chief Tim Welke's 21st supervised Replay Review of 2014. This is the 53rd, 54th ejection of the 2014 MLB Regular Season. This is the 325th Replay Review of the 2014 MLB Regular Season. This is the 23rd player ejection of 2014. Prior to ejection, Cabrera was 0-1 in the contest. This is the 22nd Manager ejection of the 2014 MLB Regular Season. This is Tigers Acting Manager Gene Lamont's first Replay Review of 2014 (Tigers overall 11th). >> This is the first 2014 Replay Review by an Acting Manager due to ejection or absence (.000 CSP). This is the Tigers' 1st/2nd ejection of 2014, T-1st in the AL Central (DET, KC 2; CLE, MIN 1; CWS 0). This is Miguel Cabrera's first ejection since Sept 9, 2013 (Brian Gorman; QOC = Y [Check Swing]). This is Brad Ausmus' first ejection since June 11, 2008 (Angel Campos; QOC = N [Check Swing]). This is Tim Timmons' first ejection since April 26, 2014 (Joe Maddon; QOC = Y [Balls/Strikes]). Umpires are now 170/325 (.523 Affirmation Rate) in Replay Reviews during the 2014 MLB Regular Season.